Cut is the factor that fuels a diamond’s fire, sparkle and brilliance. Learn everything about Diamond Cut here. Diamonds are without question one of the world’s most precious finds, but even in the world of diamonds there are simply some that are cut above the rest. When you are looking for a diamond for that unique person, you know you want the best. It can be very easy to get lost or overwhelmed when you begin your search, as you may have discovered that there is much more involved in the diamond buying process than you originally thought. If you are looking for the best diamond, leave it with us and we will take you step by step through the process until you have found the perfect one for you. The most common question to anyone that wants the best for their beloved is what is the best cut? Tiffany Jones Designs has global offices in Russia, Israel, India and New York, and we can assure you we have seen the top of the line techniques in cutting all across the globe. Thus we can say with confidence that Russian cut diamonds are considered the cut above the rest. If you are looking for authentic brilliance diamonds, a Russian cut will be the most brilliant cut for your loved one. The term Russian cut comes from the origin of the diamond, and the process it undergoes to become an authentic Russian cut diamond. A Russian cut diamond is one that has been mined in Russia, but was also cut there. The Russian Government does not allow for the import or export of diamonds in their rough form, and thus all diamonds mined in Russia must be cut there to be used for import or export purposes that keep the economy flowing. At the same time, the Russian rough diamond is considered to be the best diamond in terms of quality, structure, and material. This is exactly why two diamonds can have ideal cut and proportions, but a Russian cut diamond will have a better polish and shine than the other Ideal Cut Diamond. The cut of the diamond is what contributes to its sparkle, brilliance, and fire. A traditional round diamond has 58 facets with each cut being precise and defined. A diamond could not be as beautiful without this precision. When you are looking at diamonds, the cut matters, and will affect the brilliance, fire, and sparkle of your stone. Brilliance refers to the total amount of light the diamond reflects, fire refers to how the light is dispersed into the color spectrum, and scintillation refers to that sparkle that is equivalent to the sparkle in your beloved’s eye when the stone is moved. How wide or how deep a diamond is will affect all of these factors. If the cut is too shallow, light will be lost and the diamond will lose some brilliance. If the cut is too deep, light will escape from the sides making the stone look dull. A Russian cut diamond includes the 58 facets, along with a special attention to these symmetrical needs by the hands of an expert cutter. Where other cutters would not sacrifice weight for brilliance, we take pride in ensuring that a brilliant diamond is your most important goal. We will sacrifice the weight of a diamond in order to ensure you receive the most impeccably cut stone with a luster and fire that is unparalleled in the industry. We will not stop polishing until we achieve the ideal cut, whereas other cutting factories will stop polishing the stone at Poor, Fair, Good, or Very Good once the diamond reaches its “critical point” (For example: most cutters will prefer to have 1.00ct with a Very Good Cut over 0.97ct with an Ideal. 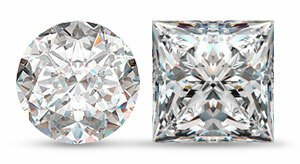 A 1.00ct diamond will have a higher rate than the 0.97ct one). We believe differently, and feel every diamond has a sparkling potential reach its ideal cut. Tiffany Jones Designs offers huge selection of Russian cut natural diamonds in order to ensure you get the most ideal cut.